The vast majority of the worlds office workers are victims of the open plan office concept. According to those that support an open plan-et they increase productivity and raise staff morale. Staff thrive in this highly collaborative environment as they happily go about their business. In recent years this office based utopia has gone to a whole new level with the hot desk and interactive workspaces taking over more and more corporate offices. There is a problem though. Open plan and its mutant cousin the hot desk free for all actually lower staff morale and productivity. 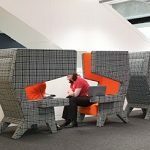 A number of studies show that employees – the people who actually work in these modern open plan wonders – are pissed off with their reality. So who supports this concept? There is a small cast of characters. Senior management and accountants who delight in lowering building costs by cramming more staff into a smaller space. Expensive exterior design companies who are only too willing to design a colourful playground for extroverts. That is about it really. Designed by extroverts for extroverts who have no concept that a huge chunk of the workforce just want to get on with their job without the chit-chat and distractions. For me the only antidote to open plan is my iPod. I didn’t realise how dependent I was on it until one day I left it at home. It was hell. Loud phone conversations and endless chatter that was only partially work-related. The drill goes like this. Bank/Insurance company (they are the ones with the fat profits to waste) engage outrageously expensive design consultants who come up with a colourful ‘out there’ concept that has no basis in reality. Management love it because it glows in the dark and they get to have it featured in glossy business magazines with their smiling face posing next to some hideous chair and desk that looks like it has come straight off the set of a low budget 1970’s sci-fi movie. Heck they will also win a few awards because in this little fish bowl of a country it is not hard to do. As long as the word ‘environmentally friendly’is plastered all over the press releases it is a winner. Throw in ‘carbon neutral’ and it is going for gold. The latest generation of open plan offices are the corporate worlds equivalent of a high end fashion industry runway event. Colourful, edgy and no practical use whatsoever. Are you getting my drift yet? Can you tell I am not happy? The only thing that would bring me some comfort is if the people that design these ‘dynamic environments’ were forced to work in their own creations for at least six months. That’s right Lionel and Mandy and the rest of the networking junkie airheads – try doing a hard lag in open plan and the inmates will soon knock you all down a peg or two.